This is an article from Max Dashu’s very interesting site. I have added the pictures, and the Ice Maiden video, which is very interesting. 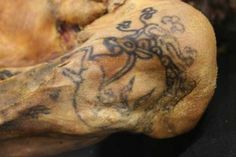 Weirdly I came across the Siberian Ice Maiden (Princess of Ukok) yesterday too, as I was looking up about Stags as symbols and she has an intricate Deer tattoo on her upper arm which is said to be the oldest tattoo in the world. This is a brief summary of a visual presentation, first shown in 1986, which was given in September 2005 at the Shamanic Studies Conference in San Rafael, California. 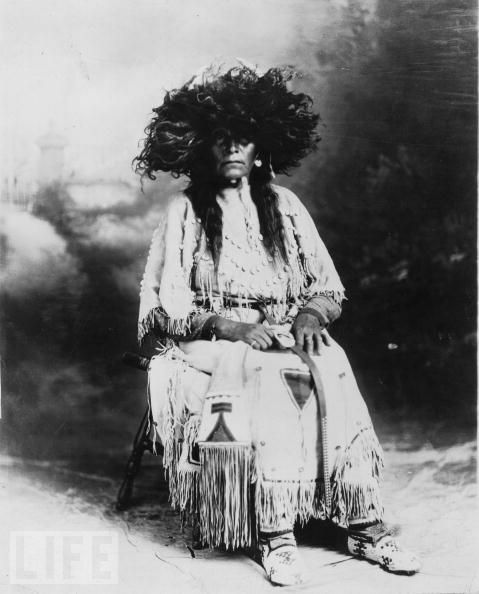 A Chukchee proverb declares, “Woman is by nature a shaman.” Yet the female dimension of this realm of spiritual experience has often been slighted. Mircea Eliade believed that women shamans represented a degeneration of an originally masculine profession, yet was hard put to explain why so many male shamans customarily dressed in women’s clothing and assumed other female-gendered behaviors. 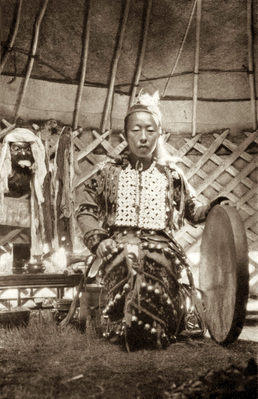 Nor does the masculine-default theory account for widespread traditions, from Buryat Mongolia to the Bwiti religion in Gabon, that the first shaman was a woman. In fact, women have been at the forefront of this field worldwide, and in some cultures, they predominate. This was true in ancient China and Japan, as it still is in modern Korea and Okinawa, as well as among many South African peoples and northern Californians such as the Karok and Yurok. There are countless other examples, including the machi of the Mapuche in southern Chile and the babaylan and catalonan of the Philippines. Images, oral traditions, and historical descriptions show women as invokers, healers, herbalists, oracles and diviners, ecstatic dancers, shapeshifters, shamanic journeyers, and priestesses of the ancestors. The Chinese Wu were ecstatic priestesses who danced to the music of drums and flutes until they reached trance, receiving shen (spirits) into their bodies, healing and prophesying under their inspiration, speaking in tongues, swallowing swords and spitting fire. 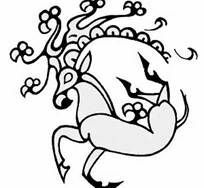 The power of the shen gathered around the whirling dancers was said to cause objects to rise into the air, to prevent wounds from forming when the dancers slashed themselves with knives. Certain female burials from ancient Central Asia have been designated as shamanic priestesses by archaeologists Natalia Polosmak and Jeanine Davis-Kimball. The priestess of Ukok (fifth century BCE) was buried in a three-foot-tall framed headdress adorned with a Tree of Life, with gilded felines and birds on its branches. Similar finds have been excavated at Ussun’ in south Kazakhstan, and from the Ukraine to the Tarim basin, with recurrent themes of the Tree of Life headdress, amulets, incense, medicine bags, and sacramental mirrors. 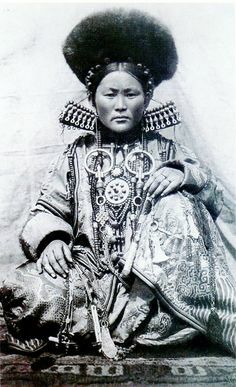 Such mirrors are also seen in the Bactrian region of Afghanistan, held facing out against the body, and they still figure as initiatory devices wielded by female adepts in Tibet. 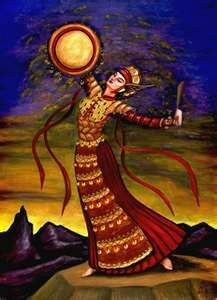 The overwhelmingly female mikogami of Japan also kept the “sacred mirror” of the sun goddess Amaterasu. My visual presentation Woman Shaman includes a sequence of women shapeshifting into animal form or riding on the backs of shamanic steeds. These themes recur in many shamanic traditions, and are vividly illustrated in modern Arctic carvings. An Aleut ivory (circa 1816) shows a woman shaman wearing an animal mask. Other examples from the mid-20th century include “Woman Riding a Bear” by Cecilia Arnadjuk, Repulse Bay, Canada; “Woman/Polar Bear” by Odin Maratse, Greenland; a walrus-tusked “Woman Shaman” by Nancy Pukingrnak of Baker Lake; a half-woman, half-walrus piece titled “Woman Shaman Transforming Herself”; and “Medicine Woman” by Kaka of Cape Dorset. The darwisa or maraboutes of North Africa bear Islamic titles, but practice much older North African customs. Among the Tunisian cave-dwellers, the darwisa cures sick people from possession from the jnun. In the ritual, she plays drum rhythms to discover which jinn caused illness; when she hits the right one, the person begins to dance. 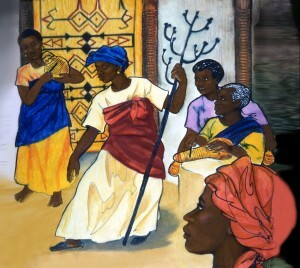 Then the darwisa talks to the spirit about what caused the illness and what is required to cure it. 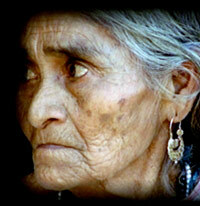 Invocatory chants have remained an element of Mexican Indian shamanism. One of the great master was Maria Sabina, “the woman who knows how to swim in the sacred,” whose incantations seem to have acted as a means of entering into deep states of consciousness. Laying on of hands was part of her healing practice. Further north, in California, Bernice Torrez of the Kashaya Pomo, healed by touching and removing spirits of illness from the body of the sick person. She was the daughter of Essie Parrish, the great yomta, a title which means “Song.” This prophet-seeress carried chants for ceremonies, healing, and control of the elements. Chant and shaking a sacred rattle are important elements in the practice of Katjambia, a Himba medicine woman in Namibia. As she shakes the rattle, she calls out Njoo, Njoo, in a “secret language from Angola.” After absorbing the negative energies into her own body, Katjambia returns to the sacred fire of her ancestors, who release them. A song by the Chilean composer and folklorist Violeta Parra celebrates the powers of the Mapuche machi, describing how she presides over the guillatún ceremonies and how her shamanizing cures the sick and brings a crop-threatening rain to an end. 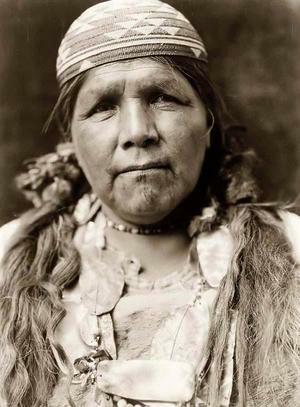 The healing power of female shamans was occasionally stated to have been so far-reaching that they were described as being able to restore life to the dead. So it was told of Pa Sini Jobu, great Tungutu of the Bosso people in the middle Niger region. Her method of dancing to ecstasy and shifting into the form of a great bird echoes the story told of Isis. Both the goddess and the Tungutu are described as beating their wings over the dead (a ram, in Pa Sini Jobu’s case) and bringing them to life. (The Colchian sorceress Medea is also pictured bringing a ram to life, using a cauldron, herbs, and incantations.) In western Africa, the sorceress Kulutugubaga has the power to heal all and bring the dead to life. She is the last of the legendary Nine Sorceresses of Mande. Reviving the dead was one of the marvels performed by Yeshe Tsogyel, a foundational figure of Tibetan Buddhism. In Lady of the Lotus Born, she says, “… In Nepal I brought a dead man back to life… My body journeyed like a rainbow in celestial fields…” (5) This 8th-century poem is loaded with shamanistic content, recast in a Buddhist mold. The shamanic Bönpo religion is known to have contributed many elements to Tibetan Buddhism. A Manchurian epic, Nishan Shaman, turns around the story of a woman who is the most powerful shaman in the country. She is called upon to revive the son of a rich man after countless others had failed. She beats her drum, chants, and sinks as if lifeless herself while journeying to the Otherworld, where she meets up with Omosi-mama, the “divine grandmother” who “causes leaves to unfurl and the roots to spread properly,” who is the giver of souls and protectress of children. It was she who ordained that Nishan would become a great shaman. Of course, Nishan finds the soul of the dead boy. But she is pursued by her long-dead husband, who demands to be saved as well, but she calls for a great crane to seize him and throw him back into the city of the dead. The shaman is hailed as a heroine when she comes back to the upper world and showered with riches. 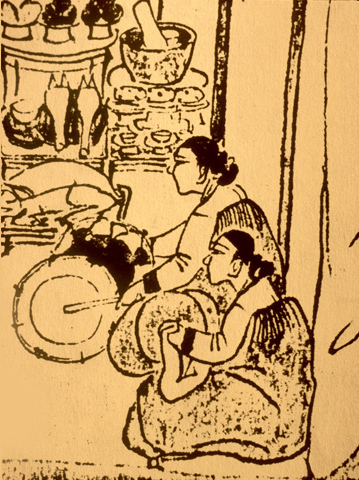 Later she faces repression from Confucian authorities who accuse her of not being an obedient wife, and they burn her shamanic regalia and drum. In much the same way, Spanish colonials persecuted women shamans in the Philippines, calling them “devil-ridden old women” and “witches,” and destroying their shrines and sacred objects. Maya oracles and shamans faced the same treatment; the Tzoltzil priestess María Candelaria raised an insurrection in Chiapas in 1712 to resist the repression of the indigenous religion. Several hundred years ago, the Jesuit Acosta wrote that Peruvian witches were shapeshifters who could journey through the skies and foretell the future “by means of certain stones or other things they highly venerate.” He and other Spanish sources agreed that the witches were mostly old women. The colonials imposed their own preconceptions on Peruvian shamans, notably that of the devil and flying ointments, and persecuted these Quechua and Aymara women shamans as witches. This is necessarily a truncated synopsis of a presentation which has not yet been committed to writing, but I hope it conveys a glimpse of a very international spectrum of women’s shamanic experience – and leadership. 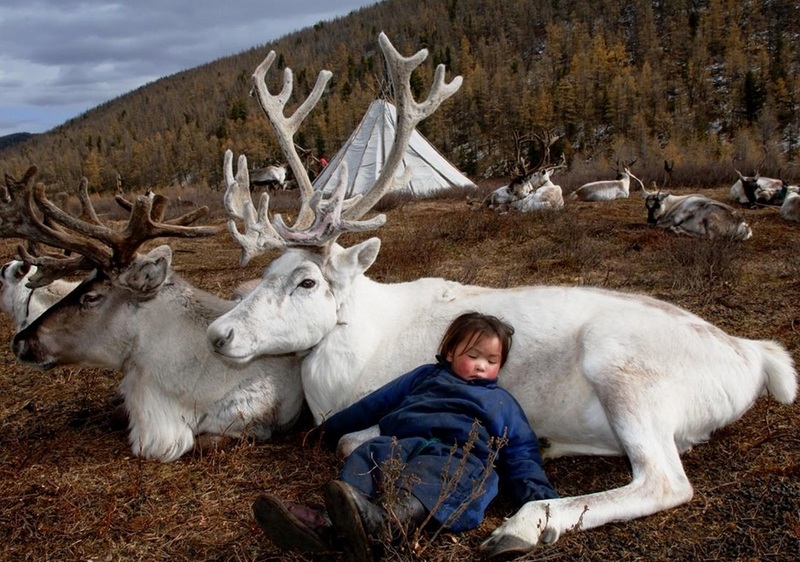 Please could you let me know if you own the copyright for the Buryat Shaman Woman image? We’d like to use the image in an article about women in medicine. Thank you. Dear Mrs Kelly, No, I do not own any copyright on the image, sorry. Thank you for visiting. OK thanks – do you by any chance know who does?? You must have been in touch with someone yourself if you’re using it on your website?